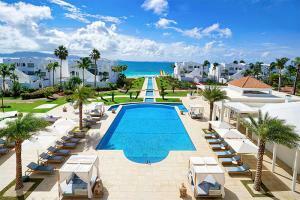 Enjoy a unique blend of relaxed elegance coupled with five-star service at CuisinArt Golf Resort & Spa. Its collection of 91 luxurious suites and seven villas are graciously appointed, expansive and overlook white sand beaches and Rendezvous Bay’s turquoise waters. Guests are invited to savor fine dining at the resort's restaurants with feasts for all five senses. Greg Norman’s Signature Design 18-Hole Championship Course is the ultimate golf experience on Anguilla. Spa by CuisinArt has a renewed focus on whole body wellness and biodynamic treatments. The pool is legendary and transformed with teak loungers, private cabanas, and a new Splash Pad play area for kids of all ages.